Here I'm going to show you how to make bookmarks with paper. 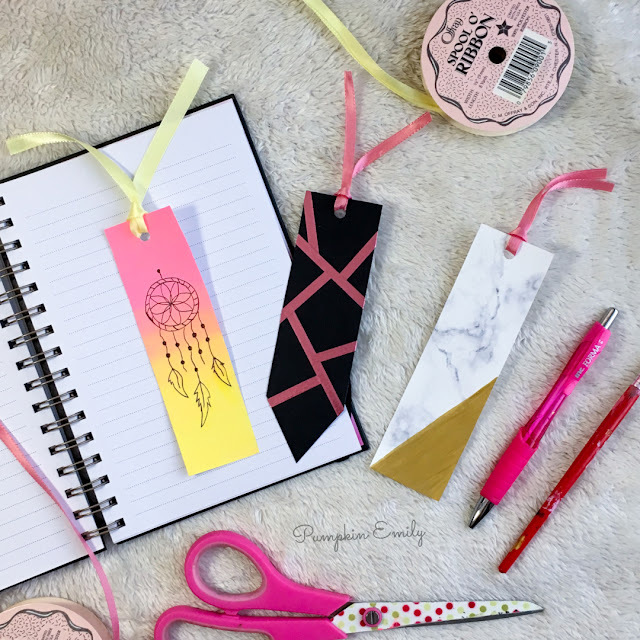 I'll be showing you how to make a to make a ombre bookmark with a doodle on it, a marble bookmark and a geometric bookmark. 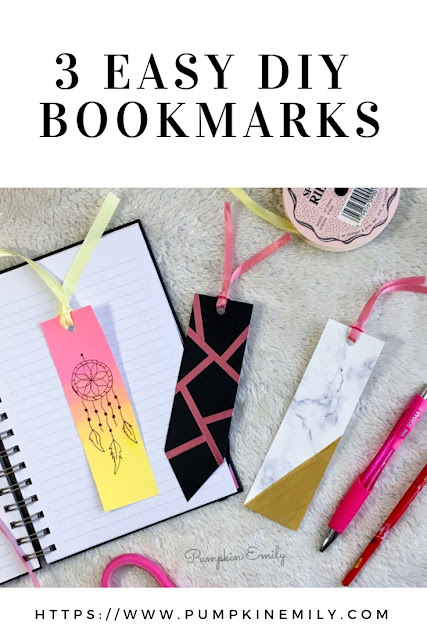 These bookmarks make great gift ideas and they can be any shape and color. Which one is your favorite? My favorite is the ombre bookmark. 1. Cut out a bookmark of any shape or size out of any color of cardstock paper. 2. Take any color of washi tape and place a piece of washi tape in any direction that you want onto it. 3. Take a second piece of washi tape and do the same thing but place the washi tape in a different spot and in a different direction. You want to repeat these steps until you like how your bookmark looks but make sure you leave a spot to leave a hole. 4. Once you like how your bookmark looks you can punch a hole into the bookmark with a hole puncher. 5. Take a piece of ribbon and fold it in half. Then you want to run the ends of the ribbon through the back of the bookmark and then you want to pull the ends of the ribbon through the loop. If the ribbon is to long you can cut it to make it shorter. 1. Cut out your bookmark into any shape or size out of white cardstock paper. 2. Place the bookmark on a scrap piece of paper so you don't get paint onto anything. For the ombre part of the bookmark, you're going to need two colors of acrylic paint and two paintbrushes. 3. You want to start the ombre by taking one of those colors of acrylic paint and you want to start painting one end of the bookmark and you want to continue that color of paint to the middle of the bookmark. 4. Take a second paintbrush and the second color acrylic paint and paint the other end of the bookmark and you want to continue that color of paint to the middle of the bookmark. 5. Once you get to the middle you can quickly blend the two colors together which will give a third color in the middle and a ombre effect. You can blend the paint more by adding some paint to the paintbrush and then you can wipe some of it off and you can blend what's left on the paintbrush onto the middle of the bookmark. I found that this helped me blend the colors more easily. 6. Once you like how your bookmark looks you want to pick up the bookmark and move it to a different place on the scrap piece of paper so it doesn't get stuck to the paper and then you want to wait for the paint to dry. 7. When the paint is dry you can put a hole into the bookmark with a hole puncher and then you can start drawing anything that you want on your bookmark with a pencil. 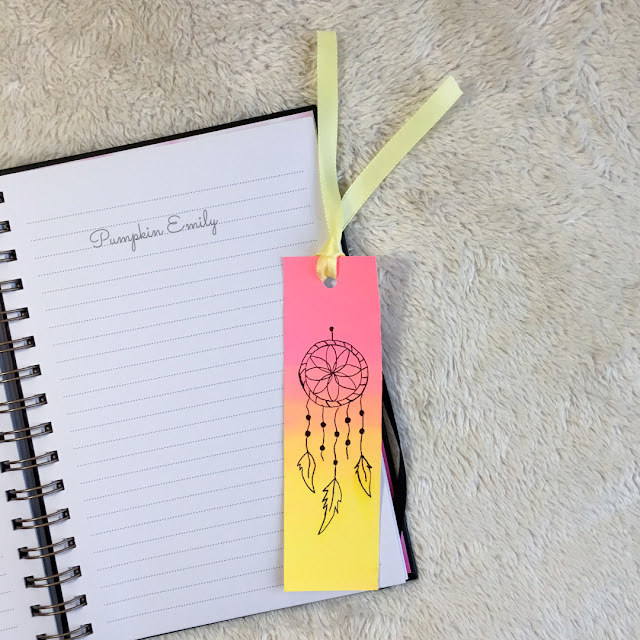 I decided to draw a dreamcatcher but you can draw whatever you would like and I do recommend drawing on a scrap piece of paper before drawing on your bookmark so you don't mess the bookmark up. 8. When you're done drawing on your doodle you can go over it with a pen. 1. 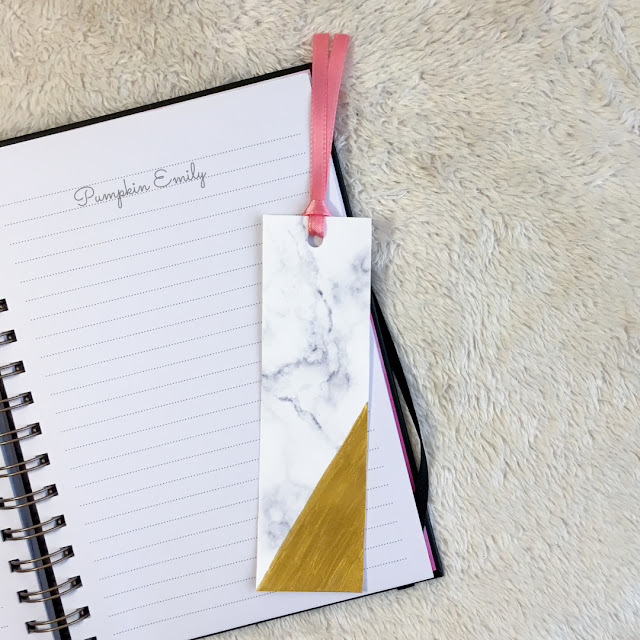 Print off a picture of marble onto cardstock paper and then you want to cut out your bookmark that's any shape or size. 2. Take a ruler and find where the middle is and then you want to draw a line from the edge of the middle of the bookmark to a corner of the bookmark. 3. Paint that part of the bookmark in with any color of acrylic paint. 4. When you're done painting the bookmark pull it off of the paper so it doesn't' get stuck to the paper and wait for it to dry. 5. When the paint is dry you want to put a hole into the bookmark with a hole puncher and just like the other bookmarks you want to get a piece of ribbon and fold it in half. 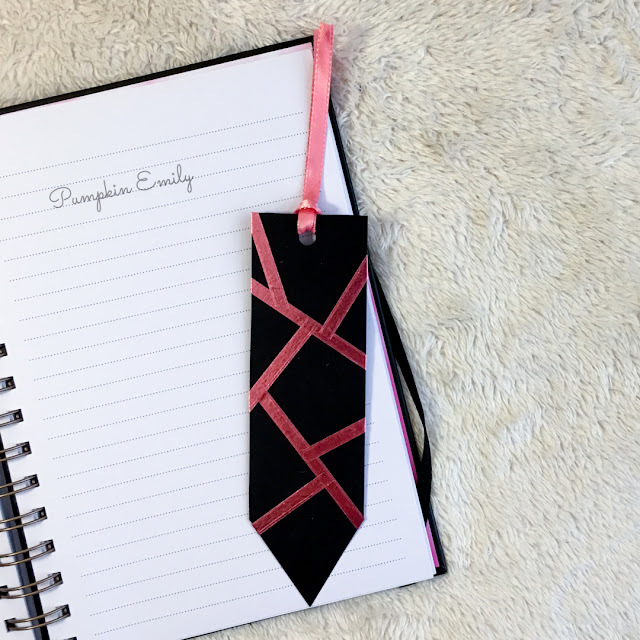 Then you want to take the ends of the ribbon and run them through the back of the bookmark and then you want to pull the ends of the ribbon through the loop. They turned out really nice! I'll try making these with my girl, fun and easy to make! They look amazing dear, I loved it!